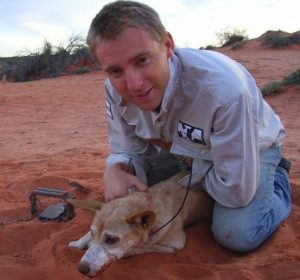 In this training video, NSW National Parks and Wildlife Service senior pest officer Rob Hunt describes and demonstrates the canid pest ejector for wild dog and fox control in Australia. He explain how the CPE works, the associated bait types, how and where to set the CPE and basic maintenance. A NEW humane control method for wild dogs and foxes with less risk to non-target species has passed field testing in outback South Australia. University of Southern Queensland wildlife ecologist Ben Allen and his team have successfully trialled the delivery of the toxin PAPP (para-aminopropiophenone) in capsules via target-specific canid pest ejectors. Canid pest ejectors are spring-activated delivery devices that propel toxins directly into the mouth of a wild dog or fox as it pulls the bait placed on the head of the ejector. They pose less risk to non-target species than ground baits. The intent of the trials in the Strzelecki Desert area was to determine the suitability of PAPP capsules for use in ejectors. Currently, PAPP is only registered for use in a manufactured bait, not capsules, and only 1080 in capsules is registered with the Australian Pesticides and Veterinary Medicines Authority. In a paper published in Environmental Science and Pollution Research, Dr Allen said the efficacy of PAPP in ejectors was tested on wild dogs (1000mg dose) and foxes (400mg dose). Time-to-death, physical signs of poisoning and other related factors were assessed. Ten of 11 (91 percent) wild dogs used in controlled trials died within three hours after PAPP administration. The mean time to unconsciousness was 65 minutes and the mean time to death was 84 minutes. Three of four foxes also died within three hours after PAPP administration. The mean time to unconsciousness was 78 minutes and their mean time to death was 121 minutes. Carcasses of eight deceased wild dogs and one fox were found during field trials within 30-200 metres from the nearest triggered ejector. He said the trials showed that PAPP in a canid pest ejector worked as well as the more commonly used toxin 1080. Dr Allen said the trials also showed that PAPP worked as well as using 1080 in an ejector. But he said PAPP might be chosen over 1080 for use in an ejector for its welfare advantage. According to the Centre for Invasive Solutions’ PestSmart website, once PAPP is eaten and absorbed into the bloodstream, it converts normal haemoglobin in red blood cells to methaemoglobin, which cannot carry oxygen to the heart muscles and brain. Affected animals become lethargic and sleepy before quickly becoming unresponsive and dying. Symptoms are mild with no tissue or cell damage, which means that any animal that receives a partial dose can fully recover without ill effect. Dr Allen said the trial results could assist regulators determine whether or not to make PAPP capsules available as an additional wild dog and fox control option. “Hopefully, within the next year or two we should see farmers have a choice of toxins for ejectors, which they don’t have at the moment, they presently only have 1080. Dr Allen said the advantages of PAPP included the speed at which animals “go down” and when used in ejectors, more dead dogs and foxes will likely be found than with 1080. “We had 30 (ejector) pulls around a water point in the Strzelecki Desert and we found eight dogs within 200m of the water point, although individual dogs might have pulled multiple ejectors. “Five or 10 minutes later they are sitting down under a tree because they feel tired and then they don’t leave, so you will see a lot more around the place than you would with 1080,” he said. Professor Staples said the APVMA application for PAPP capsules was accepted months ago and has passed pre-screening. “It’s a very solid submission and I would be very surprised if it wasn’t approved. Professor staples said PAPP was also registered in baits called Foxecute for foxes and Dogabait for wild dogs. Dr Allen thanked Greg Conners and the Mutooroo Pastoral Company for access to the study site for each trial. Dave Berman, Deane Smith, Geoff Castle and Jason Wishart assisted with the fieldwork. Animal Control Technologies Australia managing director Professor Linton Staples and Jason Wishart provided advice on final stages of the manuscript. ACTA and Australian Wool Innovation provided financial support to undertake the trials.